If you asked me if I was starting out doing a parody mash up of Dos Equis Beer’s “Most Interesting Man in the World” and Papa Smurf, the answer is no. Just as I started drawing the famous ad man’s face I noticed his resemblance to the old blue guy. By the way if you notice some strange things with my site the next week, I am trying to update a few things. Hopefully all will be complete by next week. Is he smurfing kidding me? 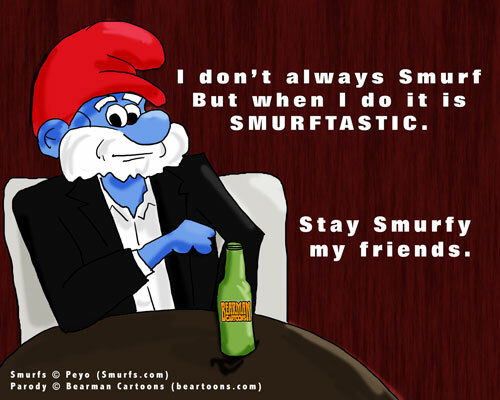 The most interesting Smurf on earf. He’s now a victim of Smurfy’s Law. What kinda updates you got goin’ on, or will we have to wait and see to be surprised? It will be a surprise to both of us. The white on black is looking dated so time to spruce things up around here. I’ll take one of those beers. It’s hot here. HAHAHA! I actually lol’d myself on that one! Good job! What about the most interesting Wombie in the world? That’s it? Smurf got your tongue? I’d hate to see Hefty all smurfed up. He’d be trouble all smurfed outta his smurf mind. I’m feeling very smurfy right now. Whatcha gonna do with your smurf self? I never noticed the resemblance before. And that is what I am here for. Ahhh! You’re right! He does look like Papa Smurf! I’m not familiar with the ad man you mention but Papa Smurf is always great to have around for a beer. If he brings the beer that is. Me too…hope to reveal my new design but it is taking some time. Great job on the Smurf, Just how are we going to tell when things START gettin’ weird around here? He shouldn’t drink if he’s feeling blue. FYI – I used an old comment exchange we had in my Friday’s post. Gave you a shout-out with it. Those ads lose their humor very quickly (as did hearing Smurfs substitute the word ‘Smurf’ for everything). Well I hope you have a Smurfy day!! Bwahahaha! I think he really is a smurf. Why, oh why, are the smurfs coming back?